Zoviet France is an idiosyncratic collective of anonymous postindustrialists, dronologists, and pseudo-ethnomusicologists. Their investigations have taken them into fictional cultures where nothing is easily located and reality often slips into the hypnagogic. Having secluded themselves in Newcastle, England since their inception in 1980, Zoviet France have developed a radical relationship with the cheap technologies of old-fashioned tape recorders, homemade acoustic instruments, primitive looping and sampling devices, and basic dub trickery. From these machines, the collective has crafted a distinctly unique vocabulary of postindustrial sonic hypnosis. Just as Zoviet France's sound was alchemic reconfigurations of inexpensive technologies, their vinyl packaging literally covered their sounds with aluminum, roofing shingles and porcelain. The godfathers of otherworldly and quixotic ambient. Also hear: German artist Kluster http://www.discogs.com/artist/153080-Kluster-3 and Japanese artist Taj-Mahal Travellers http://www.discogs.com/artist/451430-Taj-Mahal-Travellers-The . anyone who uses this word .... hypnagogic .... must instantly stop. 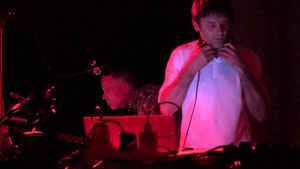 While classic Zoviet France is unparalleled in greatness, it is unfortunate Ben has taken the path of digital gear. It sure shows in the music. Nothing against computers, its just that classic era Zoviet France was this timeless beautiful thing that seemed to have vanish when Robin Storey left. The Reformed Faction is up to snuff without losing that eloquent intangible. I stepped outside while *ZF* played a show a few years ago in San Francisco when I saw the digital gear they were using but made it back to see Michael Gira play. I will however be flying to Boston to see Mark and Robin play this November. Here is an idea... how about Ben gives up the Zoviet France name and starts a misc. boring - run of the mill experimental side project. Then the Reformed Faction can restore the tarnished name, Zoviet France, once and for all! Zoviet:France is out of this world - a respectful compliment and as scary a thought on equal terms. Daring you to 'play' their records means challenge beyond formal treatment (sometimes as equally challenging when transferred onto CD). A phenomenon similar to the likes of Muslimgauze or some other obscure sound explorers - Z'ev, The Hafler Trio or Strafe Fur Rebellion. But like all of them, Zoviet:France is beauty and the beast in their own right, a non-descriptive sound-format offering stunning visual and auditive escape from the music's stereotypes. I would say that *Zoviet-France* do not create music - they create imaginary soundtracks to the movies that could've looked like something that we often see in dreams. Critics are trying to find terms for this genre - some are calling it dark ambient, some are calling it "isolationism", but in essence none of these terms will help us to define what it is really Zoviet-France are creating. According to some sources, their work usually consists of months of improvisation and painstaking editing work. Results are hard describe with ordinary terms. Its meditative and hypnotizing, but at the same time it have nothing to do with new age. Its agressive (at least in the early phase), but it have nothing to do with power electronics or harsh noise. Its influential, but at the same time few heard about it outside of avant-garde/experimental circles. So what is it, really ? A giant sound puzzle ? Hypnotizing sound walls ? *Zoviet-France* music might be all of it, but it doesn't fit into existing genres and musical schemes.